I usually don't read YA: just picked up this book at a garage sale without knowing what it was, read two pages and abandoned it. I went back to it only because I wanted a slim volume to keep up my book count for the reading challenge... but now I am glad that I did. Good for goodreads! I am in two minds about this book. The premise and story are superb, and the characters are drawn with a few deft brush-strokes. But this book is too thin, almost an outline for a novel than a novel itself. The beginning is so abrupt that I was tossed head-first into the middle of the story, and it took me quite some time to regain my breath: then some more time was spent on getting my bearings in this strange universe into which I had descended. Then, I was captivated. 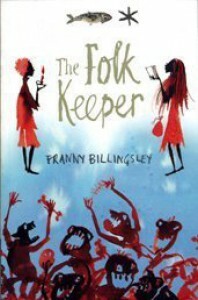 Corinna Stonewall is an orphan and a Folk-Keeper. She dresses up as a boy (Corin) and lives in the cellar of the Rhysbridge orphanage. Her task is to keep the Folk (beings which are "mostly wet mouth and teeth" - brr! Right out of M.R.James, that) from working their black magic and spoiling food and harvest, by continuously feeding them. She is jerked out of this less than idyllic but stable existence and hauled off to Cliffsend in the Northern Isles, by Lord Merton and his wife Lady Alicia, along with Lord Merton's cousin Edward. Lord Merton dies immediately after meeting Corinna, after startling her with knowledge of her secrets: but he intrigues her enough to persuade her to travel. Once at Cliffsend, Corinna begins to make startling discoveries about her true nature. The Folk are stronger here, but they are not the only denizens that inhabit the twilight world between reality and fantasy. As Corinna slowly discovers her kinship to them, the secrets of her past are also slowly revealed. The Folk Keeper is a fairy tale and Gothic romance rolled into one. The author makes use of common devices of both the genres and merges them seamlessly. I could feel the bite of the cold wind at Cliffsend, and the woodland sprites flitting about at the corner of my vision. And the resolution is satisfying to both genres. This is also a coming-of-age story, and a Hero's journey, where the heroine finds her true nature at the end (though not in the way we expect). Why only the three stars then? Well, as mentioned in the beginning, the story is spread too thin. It seems as though Ms. Billingsley was in a hurry to get the novel out. I can't help feeling that this is one book which would have been better if it had been a little fatter.